Green Left Weekly journalist, Federico Fuentes with Cucaracho, from the colectivo Alexis Vive, in the 23 de Enero barrio in Caracas. Photo by Zuleima Vergel. “On February 23, there were some small protests on this side of the border in disputed areas, areas where you have Colombian paramilitaries who are struggling to gain control of the area because it’s a strategic region for them. “The media always take the side of the opposition; they don’t tell the truth. 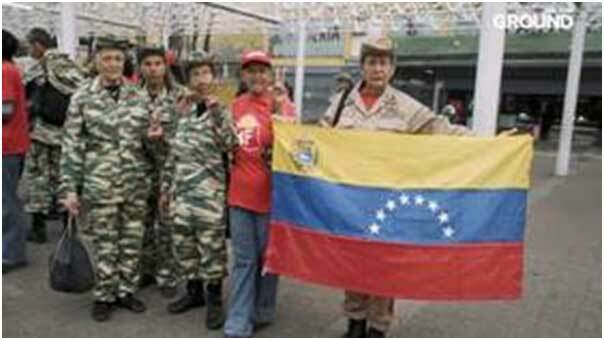 “Because they’re just a few people, then violence against Chavistas, the colectivos, is justified. The media dehumanises them, portrays them as non-human, so in the end it doesn’t matter if they treat them like animals or kill them.